In our last CMC we discussed the importance of “clear eyes,” sharing that when a child’s eyes are clear and full of light, they are free of defiance, challenge and guilt. This month we want to answer the question Patricia raised as she pondered what she would have done differently in her parenting especially in light of our topic growing in favor with man. In addition, there was the question of how would she encourage you in parenting the child “who either enjoys sinning big and loud even if it is right in front of you or the one who just wants to slip a little toe over the line while hardly moving a muscle! ?” To help answer those questions, Patricia offers some words of wisdom for all of us. Listing the consequences that will be enforced when the rules are violated. Making it your goal to work on only one thing (behavior or attitude) at a time. I found I always set out to do this but like a snowball rolling down-hill, one infraction led to another which, of course, revealed another area of needed training and pretty soon I could not see the forest for the trees. Everything seemed to be an infraction worthy of correction and we were all pretty miserable. Reminding yourself via post-it notes what that “one thing” is. Being consistent in addressing the problem for just one day and then seeing if you can go several days…. be as patient with yourself as your Father in heaven is with you. When you see an infraction, even if it is not the one you are currently working on, being sure to make your child aware of it and telling him that the day will come when that behavior or attitude will make it to the # 1 spot on the list. Then write a note for future reference. Teaching your children to SERVE. Serving was one of the hallmarks of Jesus’ time here on earth. He offered water to the woman at the well. He healed and He did the audacious, the unthinkable. He took off His outer garments and performed for the disciples a task even a Jewish slave would not perform – the washing of feet. In Philippians, Paul reminds us to have the same attitude Jesus had when He, “did not consider equality with God something to be grasped but humbled Himself…” Based on that I would encourage you to provide plenty of opportunities for your children to serve neighbors, family members, or in the children’s ministry at church. Service is distinctively different from a paying job. Service helps cultivate core values; it will help your children to mature, as well as cause them to appreciate a paying job when that day comes.Instead of placing my children in the Jr./Sr. Sunday school program, we took the year between elementary school and middle school to set up opportunities to serve at the church in some capacity. Provide the child ample (meaning lots and lots of!) time when following through in the correction/forgiveness/restoration process. As this child grows and matures, it is important that he not only thinks about his offenses, but actually comes to the place of “owning” them. This child must see the difference between simply acquiescing to the “big people’s” wishes, that is, merely tolerating the opinions of Dad or Mom until they leave him alone, and truly learning to submit his heart to his parents’ values and authority. Ultimately, as he grows older, the goal for this child is to transfer that submission to Jesus. (Truly, this is the goal for all of us but, as parents, understanding the transition is often more difficult when the child looks good on the surface). By working through this process, it will bring him to the place of serving others with a pure heart. Be sure to wait after asking your child to go into another room for a reflective sit time which is time to think about what he has done wrong. Waiting is important because you are not just looking for the rote answer of “I’m sorry I hit my sister,” so you and the child can move on with the day. You see, this child is hoping you will be happy with that answer and be done with it. Instead, wait for the complete answer, one that is pleasing to the Lord, from a right heart. Does he really understand the principle he violated (an astute child will be able to do this) and just as important, does he understand how his actions affect others? I remember once all of us were held hostage because a task was not finished and we were all waiting on this child so we could go on to the next fun activity. Solution? Having 2 or 3 phone numbers of friends or babysitters on speed dial —– people who would be available to come and sit with him while he took his time to complete a task. Then the rest of us would be free to move on and enjoy our activity. One last word of caution: We need to be careful when our child who looks the look and seems to walk the walk begins to make choices that cause us to scratch our heads. Is it possible that both parents and the child have fallen into the trap of not walking that extra mile to attain compliance for the right reason, but have accepted compliance for the sake of expediency? We need to be careful not to lower the standard by accepting“almost clear eyes” as good enough. In our lives of extreme busyness this is easy to do. So moms and dads, clear your calendars! Think of the activities sacrificed and the time spent as an investment into the future of your child’s productivity and relationships. Remember that each one of us, as parents, cannot teach or train our children beyond our own moral maturity. To “grow in favor with man” (doing the right thing for the right motives) is as important for us as it is for the next generation. This is a skill that takes a heart willing to yield itself to God with a greater goal than just making it through the day. 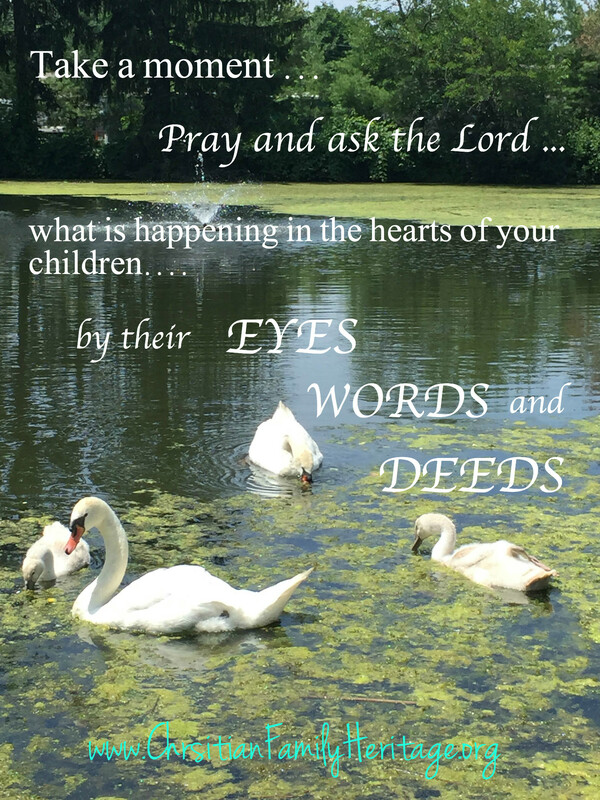 Take a moment, pray and ask the Lord what the hearts of your children are telling you by their eyes, their words and their deeds. Our God longs for us to come to Him anytime for any reason; and He is always full of grace, truth and mercy towards His children. As a Board we realize that this topic of motive (and discerning motives) and the whole issue of “clear eyes” is one that is not easily unpacked or understood. Over the next several CMC’s we are hoping to provide additional practical examples from our own families. Many of us now have those young adult children and we are working to equip them with the resources and tools to make wise choices. However, while we fully understand our role as parents is not to make our children perfect, we do realize there are areas that we’ve grown in ourselves and think, “If I had only understood …” Knowing that the current generation of parents has new cultural challenges to deal with, we hope that by sharing the practical wisdom God has given us with be of encouragement to each of you who read the CMC. If anyone forces you to go one mile, go with him or her two miles.